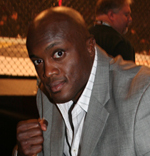 PWTorch.com - MMA News: Bobby Lashley shocker - Lashley loses first MMA fight at "Strikeforce: Houston"
MMA News: Bobby Lashley shocker - Lashley loses first MMA fight at "Strikeforce: Houston"
Former WWE and TNA wrestler Bobby Lashley lost a controversial decision to heavyweight fighter Chad Griggs in the opening TV bout of tonight's "Strikeforce: Houston" card airing on Showtime. Lashley (now 5-1) lost via TKO in the second round after Griggs (now 9-1) landed a barrage of right hand blows to the head as the bell sounded. The fight wasn't stopped until after the bell when Lashley was declared unable to continue. Early in the first round, Griggs opened up a cut on Lashley, who repeatedly went for take downs during the fight. With 33 seconds remaining in the second round, the referee called for a "time-out" for Lashley's cut to be tended to. At the time, Lashley had Griggs on the ground in control of the fight. The referee resumed the fight with both men in stand-up position. Lashley went for his fifth take down of the figth, but Griggs blocked and clubbed Lashley with right hand blows. The crowd roared as it became a question of whether the fight would be declared or time would run out on the second round. The fight was then stopped after the bell, giving Griggs the upset victory and stunning the crowd. After the fight, Griggs cut a "babyface underdog" promo while Lashley left the cage looking dejected and not completely alert. Backstage after the fight, Lashley was taken off on a stretcher. While Griggs was giving post-fight interviews, Lashley came by on the stretcher attempting to share a word with Griggs after their two-round fight. -- READ MORE: For more analysis on the fight, Lashley's loss, what it means for a possible Lashley vs. Batista fight, and Lashley's future, read my live coverage report in the MMA News section. -- ALSO SEE: MMATorch.com editor Jamie Penick's live coverage of the "Strikeforce: Houston" fight card.